It’s the first week of October, the nights are drawing in so it can only be one, well three things, the ultimate race in the Summer Handicap Series, the first Cross Country race of the season and the Cardiff Half Marathon. 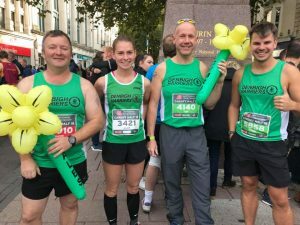 Let’s not forget Chester Marathon, Metric Marathon and parkrun – another busy week in the life of Denbigh Harriers. We start the week on the fields on Tuesday night with the series to be decided by this final race. Needing to have raced 5 races to win, anyone having raced more than 5 gets to drop their worst performances. Tony Benton was the series leader going into this race with Phil Hayes second whilst Diane Roberts in third has a 19th place to drop. There was all to play, and race, for. Contrary to the rest of summer, 13C and rain meant this was dreadful weather but still great and fitting conditions to end the series. Great to see returning faces and new faces meaning the top 3 was made up by a returning Tracey Williams who’s been out for well over a year, Ruth Crowther took second also returning from injury with newcomer Mark Jones on his first handicap outing in third. With our stats man, organiser, handicapper and race referee Chris Baldwin watching the runners come home, Chris was furiously counting positions and places. How would Tony, Phil and Diane finish and would this change their places? Would an outsider sneak it at the finish? Diane put in a storming run to finish first of the three in 4th (33:57), meaning her 19th position was dropped and the pressure on Tony and Phil. Next home was Phil (20:44) in 7th, another solid run, so where would be finish? Tony’s worst position going into this race was 12th – would he drop this position? Well Tony (22:34) did and finished in 11th. Chris, frantically tallying, realised he was right this season couldn’t have been any closer – Diane and Tony both finished on 30 points and were declared joint winners. Phil took 3rd just 2 points adrift with Tony Wood, who’s efforts were hampered by a twisted ankle earlier in the season finished 4th with 45 points. Well done Diane & Tony well-deserved winners of the Noel Morris Handicap Summer Series. 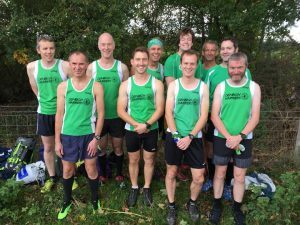 Staying on the grass we head to Baschurch for the inaugural race in the North Wales Cross-Country League. 5 races competed in over winter with individual and team glory to be fought for. With a change in the fixture list this season, we headed to Baschurch with both teams competing for the first time in Division 1. The women’s team were boosted having Rhian Pierce back. Having missed last season with injury Rhian is back on fine form and was ready to lead the women home. Fantastic turnouts for both men’s and women’s teams, though some key counters (first 6 men home and first 4 women home make up the team event) were missing due to marathon, amongst other, commitments, meant we were in a great position to get our team campaign off to a good start. And it wasn’t just the Harriers with a fantastic turnout, with as many women as men turning out for the first time. This may have been the appeal of running Baschurch in October rather than January, typically characterised by snow, rain, mud and a refreshing wake up through the stream. October, with the promised hurricane keeping away, meant firm ground, a fast course and trickle of a stream. At least the wall kept everyone on their toes. Individually, the women are off to a great start. Rhian in contention for the VF35 gold, Emma Collins the VF55 gold and Menai Baugh in the medals for VF60. 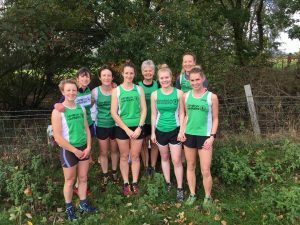 In Division 1 the women stand on 137 points from Rhian Pierce (12th 25:02), Emma Collins (36th 27:25), Alaw Evans (44th 27:52) and Victoria Whitehead (45th 27:52) in 5th just 7 points behind the 2 teams in joint 3rd. In the Masters, we stand 4th with 43 points. Not to be outdone, the Men who run 3 laps to the Women’s 2 stand 6th in Division 1 with 452 points. Thanks to counters Tony Wood (54th 36:11), Glen Price (67th, 37:07) Dan Jones (74th 37:30), Owen Conry (83rd 38:14) Steve Gadd (86th 38:28) and Mat Jones (88th 38:54). In the Masters, we stand 10th with 140 points. Excused from cross-country duty were Shaun Hughes and Joe Welch, both heading to the Chester Marathon to further push themselves as they both build up to London next year. Shaun with a championship place, Joe with a good for age place – both incredible accolades. Joe additionally was running in red as he’d been selected to run for the Celtic Nation Masters against the English Masters who organise the clash selecting the runners to race against them. Both finished in the top 100 in this 2700 strong field, incredible enough and both getting PBs, Shaun dipping under 2 hours 44 minutes for 44th in 2:43:50, Joe took over 4 minutes off his PB in 93rd and 2:51:20. Competing in the Metric Marathon – 26.6k – Lisa Dafydd on her 3rd long race in consecutive weekend, stepped up from half marathon distance for her furthest race finishing in 3:00:46. So down to Cardiff for the UK’s 2nd largest half marathon with 25,000 runners taking to the streets and whilst you might think this race is flat, it’s anything but. 7 Harriers on the start line, for many of them a culmination of summer training, for others a step on the road to the next race. With both summer training and marathon training paying off, Huw Williams led the Harriers home with a PB in 1:34:58. Fellow runner at the upcoming Snowdonia marathon at the end of the month David Jones was next home in 1:39:24. 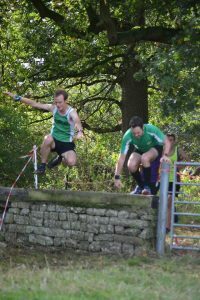 Hywel Roberts took the third Harriers spot with a PB of 1:39:30. Ian Jones was next in 1:50:43, 2 mins faster than Lake Vyrnwy Half Marathon last month. Also in training for the Snowdonia marathon and running her second race in 2 days, Alaw Evans finished in 1:51:11. Mari Williams finished the course in 1:57:49, with David Spencer completing the course in 2:11:38 having contended with a calf injury before and during the race. Given the level of racing it was a quiet week at parkrun with 4 Harriers running at Bodelwyddan Castle. Great runs for Ceri Belshaw and Sarah Bayliss, 1st and 3rd ladies respectively in a new PB of 23:15 for Ceri, 27:50 for Sarah. Mark Jones also finishing in 36:05, with Gwenan Johnson finishing in 36:34. This entry was posted in Cross-country, Half Marathon, Marathon, Parkrun, Road running, Summer Handicap Series, Weekly report. Bookmark the permalink.